​On the afternoon of your visit, you will be picked up from your place of accommodation and will drive for approximately 1 hours through scenic agricultural areas, hills, and beach, before arriving at the Sanctuary. 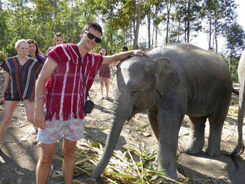 There, you will meet your English-speaking guide and learn a little about the elephants, before changing into traditional Karen clothing. 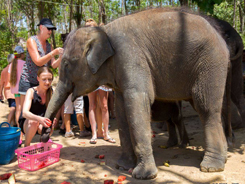 After being allocated bananas and sugar cane to feed to the elephants, you will walk with your guide through the Sanctuary, where you will find free-roaming elephants and hear their individual stories. You can touch, feed, photograph, and interact with the elephants at your leisure while you learn about their lifestyle and behaviors. After you have met all the elephants, you will accompany them to a nearby mud spa. Get muddy with the elephants as you apply a healthy cosmetic mud treatment to their skin. 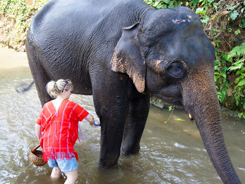 Next, you will walk with the elephants to a nearby river and join them in the water for a refreshing bath. Take a swim and help bathe and brush the elephants while they wade through and play in the water. 13.00 Arrive at Elephant Jungle Sanctuary Phuket. Enjoy a welcome snack, sip tea or coffee, and learn about elephants as you are given an introduction to our program. Assist with the preparation of natural dietary supplements for the elephants. 13.30 Meet the elephants. Feed them and administer dietary supplements as you learn their stories.Play,interact and take photos with the elephants in a natural setting. 14.30 Mud spa with the elephants. 15.00 Join the elephants in our specially constructed outdoor ´Elephant Shower Room´ and cool down as you bathe them. 15.15 Use our facilities to take a (regular) shower, dry off, and change clothes. 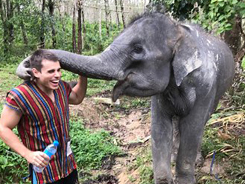 15.30 Eat a meal of traditional Thai food, freshly cooked Pad Thai, and seasonal fruit, before saying goodbye to the friendly elephants. 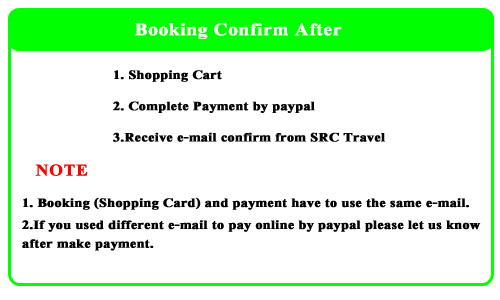 16.30-17.00 Drop off at your hotel or accommodation. Please Note At the Sanctuary, we will allow you to spend as much time as possible with the elephants. Therefore, there is no formal schedule and aside from pick-up times, the times shown here are approximations.